This entry was posted	on Monday, May 23rd, 2011 at 11:58 pm	and is filed under Podcast Episodes. You can follow any responses to this entry through the RSS 2.0 feed. You can skip to the end and leave a response. Pinging is currently not allowed. hehe, engineering rowboat FTW! 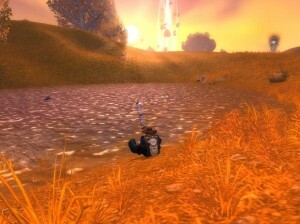 I quite enjoy a spin about on my river boat out in the flooded shimmering flats area. I would greatly enjoy puttering on that boat in other places….perhaps one day! Hi I tried email warcraftlesstraveled at gmail and it bounced, and I cant find any other email for the show, how do I contact you? Im amazed to hear about this ring by the way, the odds of finding it are less than wining the lottery! I tend to agree with you about the ring… not only is it a low percentage chance to shag the fish, but then there is a low chance with each fish that the ring will be inside. Kinda makes Mr. Pinchy sound like a walk in the park in comparison, huh? Thanks for supporting the show & good luck with getting Stendel’s Bane! I just wanted to drop a line and say thanks for all the good times you have provided me. All your podcasts are amazing, and give me stuff to do that I never knew existed. I still haven’t caught the fish though…. le sigh.